As a gamer with a collection of games that is approaching 200 items, I often think about why I spend the money and time on this hobby of mine. I also like to connect with other game collectors, if only to make myself feel better about my love of games of all sorts. While reading about another collector’s blog about his collection of chess boards, I began to think about what makes chess sets so collectible. There are whole websites devoted to the history of chess sets as well as physical museums with examples of different boards from around the world. The British Museum even has on display a set of chessmen found in Scotland and believed to be about 800 years old. And surely this is part of what makes it interesting to collect chess sets – the sense of history. Chess is an old game that we still play today and one that has spread around much of the world. Not many other games fit that category. Looking at an old chess set is very much a glimpse into another culture or time. And since quality chess sets are often, by necessity, made of very durable materials, even purchasing a modern chess set feels a little like investing in something that will someday bear our own history with it as it gets passed down through the generations. Part of what allows this sense of time and place to accrue around a beautiful chess set is the very nature of the pieces. A set of checkers or dominoes could also be made of fine materials, but these games have a uniformity to the pieces. 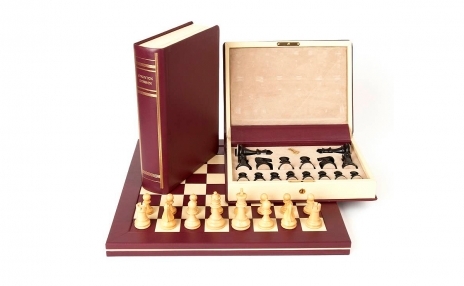 A chess set, on the other hand, offers six distinct designs in each of two colors. This variety allows sculptors and designers a great deal of leeway when creating a set of pieces. A knight from Norway in the Middle Ages will look very different from a knight from modern America, yet each will share some common aura that marks it clearly as a knight when set in its starting position on the board. This combination of variety and similarity is, essentially, what collecting is all about. A collection, by definition, has to have something in common, yet collecting endless examples of the same thing without any variety loses the importance of each item in the collection. With a collection of chess sets, each one is clearly a chess set, yet each one can also be distinct since the variety of chess sets in the world seems to be almost endless.